All cables and the remote for the projector are located in the podium. 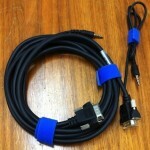 It is expected that all cables and equipment will be re-wrapped and returned there when you are done with them. Never touch the projector, the buttons are locked out and will not function. All functionality of the projector is controlled by the remote: power, input source, and speaker volume. Be sure to point the remote at the projector. 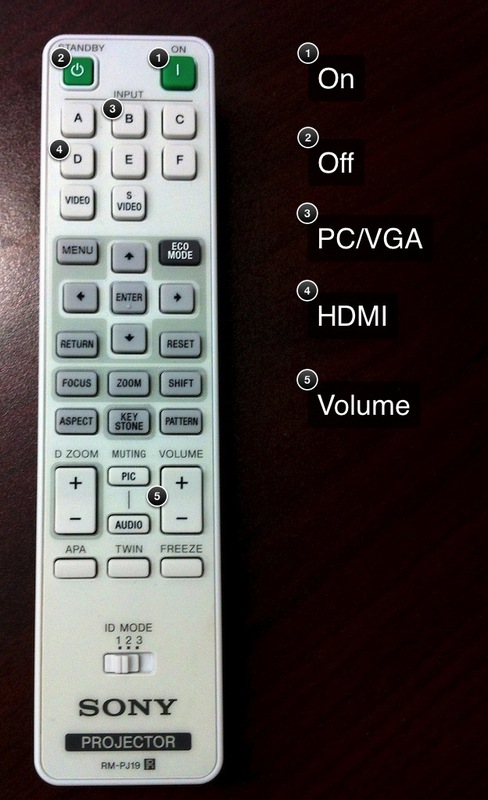 The image below illustrates the functions of the remote, but they are summarized here as well. The green button on the right is power on. The green button on the left is power off (the green light on the projector will flash for a few minutes and the fan will continue to run for a few minutes). The Input A button will select the VGA video, and 3.5 mm audio inputs. The Input D button will select the HDMI input, this is the one you want to use unless you must use VGA. 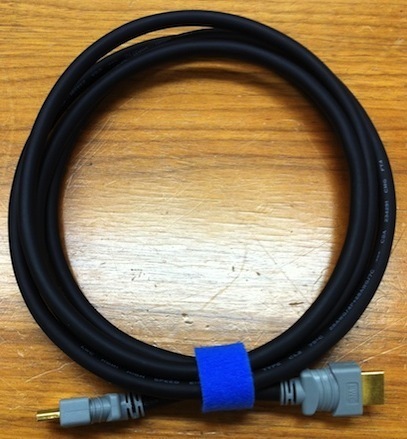 If you are using a HDMI device plug one end of the supplied HDMI cable in to your device. The other end of the HDMI cable plugs in to the HDMI wall plate. 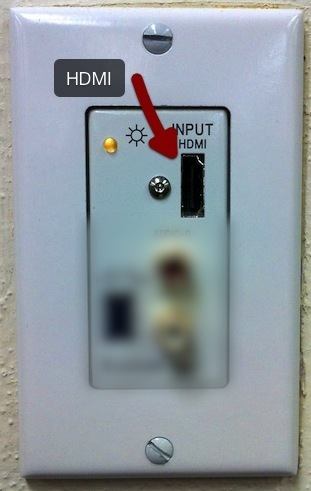 Select Input D on the projector to select the HDMI source. 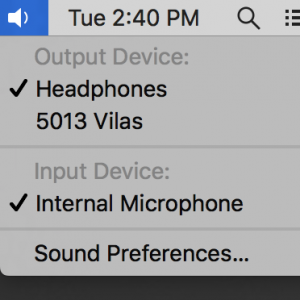 Audio for HDMI is only supported through HDMI. 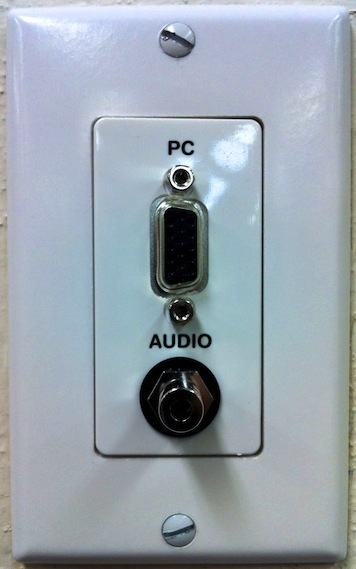 The RCA inputs on the HDMI wall plate are inactive. There is a VGA cable in the podium. Plug one end of the cable in to the wall plate, be sure to connect the 3.5 mm audio cable as well. 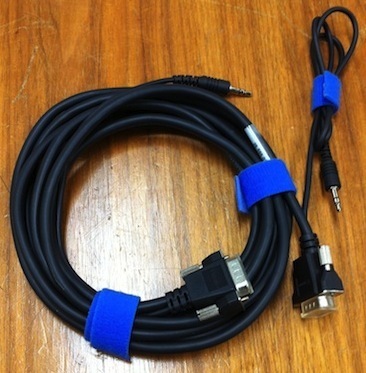 Connect the other end of the VGA cable to your device. Be sure to have the correct adapter for the VGA cable, the SJMC does not supply adapters for Macs or other devices. Also plug in the 3.5 mm audio plug to your device. Select Input B on the projector remote if the projector remains blank. If your device supports auto-detection the projector will just work, if not you may need to adjust some settings. If you encounter audio feedback or buzzing from the speakers most likely the volume on the projector is set too high. Lower the projector volume and increase the volume on your device.